Former President of Erzurum Bar Association, lawyer Mehmet Guzel who is under arrest since 4th August 2016, was sentenced to 13 years imprisonment with charge of to run armed terrorist organisation; along with him, 4 other lawyers (MSB, SA, ŞYL, HD) also were sentenced range to 1 and 5 years imprisonment. Erzurum 2nd High Penal Court convicted 5 lawyers with terror related offences such as to be member of armed terrorist organisation and to establish or run an armed terrorist organisation and sentenced them range to 1 and 13 years imprisonment. On 13th October; 3 lawyers (the couple BÖ, DÖ and SA) were taken into custody in the province of Zonguldak. The lawyers are accused of to be member of armed terrorist organisation. After 5-day police custody, while SA and DÖ got arrested and DÖ was released with probation. So far, 8 members of Zonguldak Bar Association were taken into custody and 6 of them have been arrested. Today (19/10) lawyers Özlem Gümüştaş & Sezin Uçar were taken into custody in #Istanbul (and also detention warrant issued for lawyer Gulhan Kaya) within scope of police operation against The Socialist Platform of the Oppressed (ESP) and The Law Office of the Oppressed (EHB). 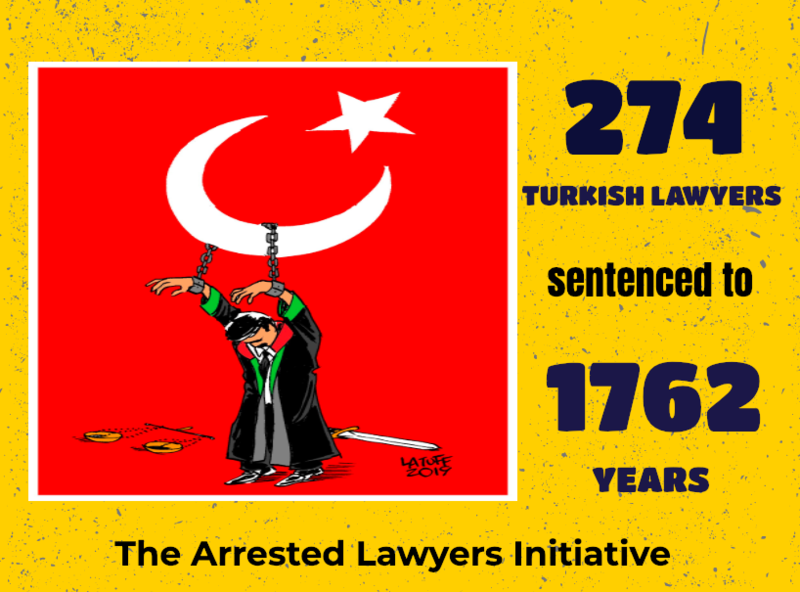 As of 19th October 2017, 552 lawyers have been arrested (since 15th July 2016) and 1403 lawyers are under prosecution. Some of the arrested lawyers were subjected torture and ill-treatment. So far, 39 lawyers were sentenced to long imprisonment. Erzincan 2nd High Penal Court sentenced lawyers Cemalettin Ozer and Talip Nayir who are (respectively) former president of Erzincan Bar Association and former board member of association 8 years 9 month and 10 years, Erzurum 2nd High Penal Court sentenced Mehmet Güzel who is former president of Erzurum Bar Association and 4 other lawyer range to 1 and 13 years, Eskisehir 2nd High Penal Court sentenced 11 lawyers to range 4 to 12 years. Sivas 2nd High Penal Court and Adana 11th High Penal Court sentenced lawyers to ranging from 3 to 9 years imprisonment with charge on being member of armed terrorist organisation.